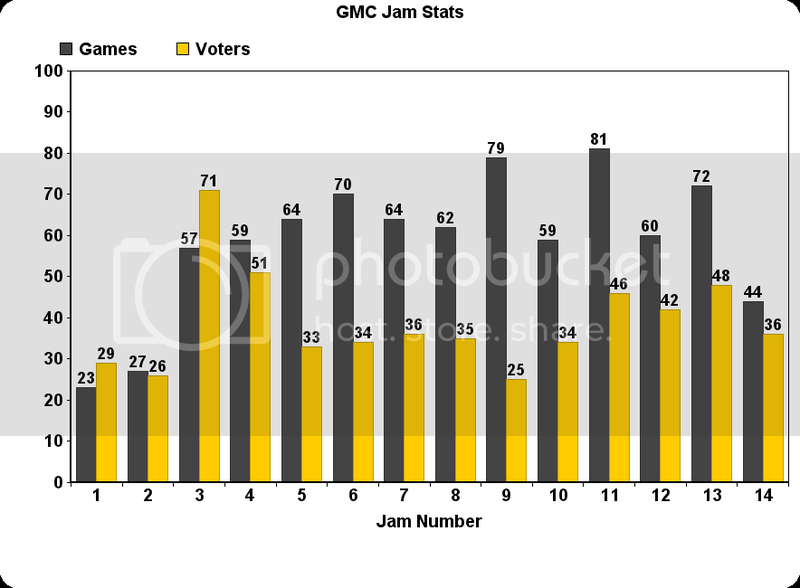 The GMC Jam Facts, Stats and Hall of Fame topic, a collection of links and quick references to find the past Jam winners, discussion and game topics as well as some statistics and facts along the way. A list is also being complied in this post linking to any Jam games that have been developed further since their respective Jams finished. If you have updated any of your past Jam entries, send me a PM with a link to their discussion topic (or a place where the game can be found) and I'll add them to the list. Please let me know if you find any inaccuracies, incorrect links or feel any extra information should be added. The numbers in brackets represent that person's Jam wins. See this post for a link to a spreadsheet showing the number of entries each user has beaten per Jam, created by GameDevDan. It's the all new Jam league table! 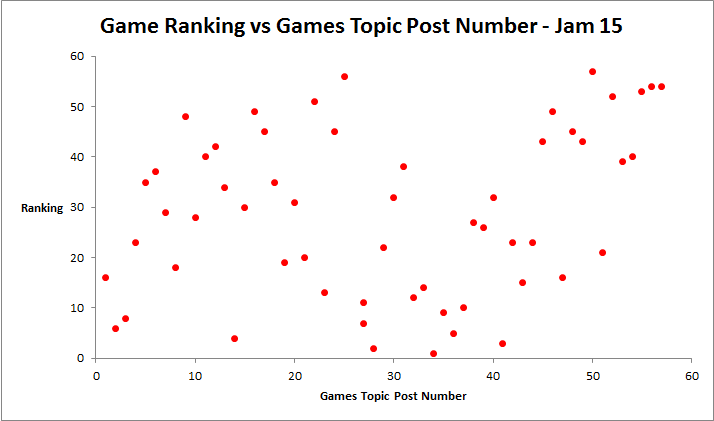 See this post showing graphs of game rank vs. post position in the games topic. 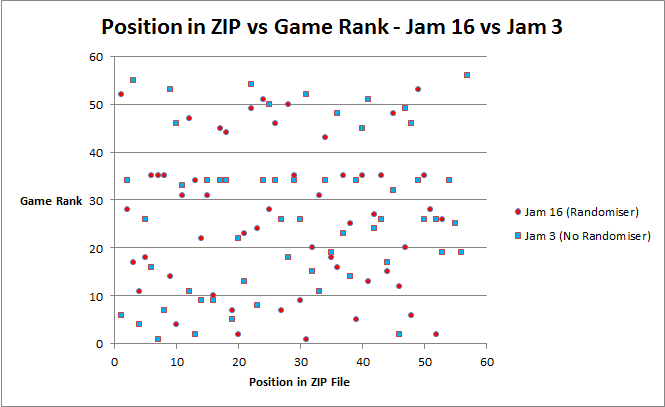 See this post showing a graph comparing results of two Jams with and without the game folder randomiser included in the zip. See this post showing a graph of game entries vs. number of voters, created by chance. 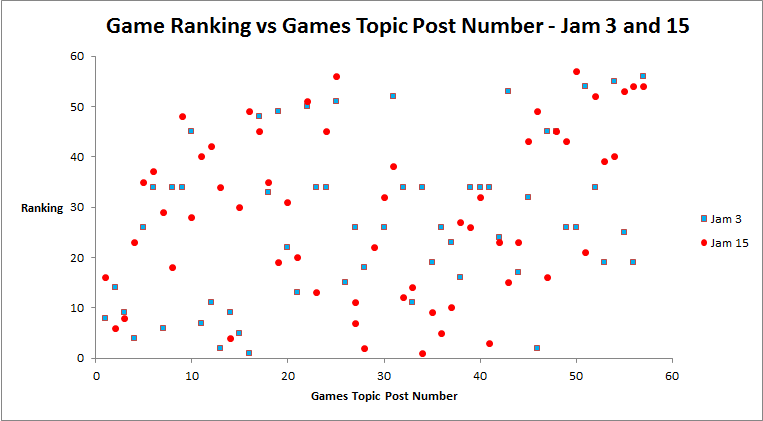 See this post which analyses the number of posters in the discussion topic vs. the number of game entries per Jam, created by mr magnus. See this post for a list of people who have entered the Jams and how many Jams they have entered up to and including Jam 18, complied by Snail_Man and RekNepZ. The full list of placings was never published for the 4th Jam- only the top 5 entries were announced. The full list of rankings was brought back for the 5th Jam however, following a discussion a few days before the results were announced. The handicap was first introduced for the 6th Jam, following a tie for first place in Jam #5. It was suggested that one of the winners should choose the theme, and the other a "special restriction". This idea took off and became the prize for coming second place in future Jams. Following a discussion topic between the 14th and 15th Jams, the decision was taken to replace the four special awards (best use of theme, best use of handicap, best overall presentation and best devlog) with three awards: Best use of Restrictions, Best Presentation and Best Newcomer. At the start of the 15th Jam, it was announced that these awards would now be voted for. It was also announced that starting from the 16th Jam, a new "secret word" would be chosen by the third placed entry of the previous Jam, however this was brought forward to the 15th Jam during the pre-Jam discussion. When the results for Jam 19 were announced the Best use of Restrictions award was no longer included and 6 awards were instead given: Best use of Theme, Best use of Handicap, Best use of Secret Word, Best Presentation, Best Devlog and Best Hidden Potato. The secret word (introduced in the 15th Jam) was chosen by the 3rd placing entry of the previous Jam. However this prize is planned to be replaced by a "hidden hype word" from Jam 19 onwards. The first "Best Reviews" award was given in the 19th Jam. The 21st Jam was originally scheduled to be held Friday 22nd January - Sunday 24th January 2016, however due to an upcoming forum changeover, it was brought forward a week with just days to go! This Jam was therefore not only the first Friday to Sunday Jam, but also the first Jam with a date change after a weekend had already been set and advertised. The 21st Jam also saw a change in that three Themes were given as options, and then with just over a day until the Jam started, people could vote for their favourite. The Theme with the most votes was then used for the Jam. Note: The 21st Jam was brought forward a week to the 15th of January 2016, due to a planned forum upgrade. As a result, this topic will be re-created on the new forums after they are made available, and the GMC in its current form is archived. Theme: 'Day and Night' or 'Sacrifice' (This Jam was the first to have the Theme voted for by the community, out of a possible selection of three Themes chosen by the winner of the previous Jam. The votes were so close that these two Themes were used). Handicap: The game must utilize humor as part of the gameplay or storyline. Handicap: Failure should result in loss of something other than progress. Handicap: Your game must attempt to teach the player some knowledge, concept, story, or wisdom from the real world. Handicap: All sound in your game must be made using your own mouth. Handicap: Dying in the game has twisted benefits. Handicap: The protagonist is a failure. Handicap: Your game cannot be a platformer. Handicap: There must be no less than five different sound effects unique from each other in the length of your game. Handicap: The graphics and gameplay of your entry must be entirely 2D. Handicap: Trains or locomotives must appear in the game at some time, and must affect the gameplay in some form. Handicap: Must contain no violence of any kind. Handicap: The game must solely use grayscale (black through white) and one other colour for visuals. Handicap: Must not contain humans nor humanoids. Handicap: You cannot use text (Excluding the game name, credits and key bindings). Edited by TerraFriedSheep, 14 February 2016 - 10:52 AM. Handicap: The game must have at least one cutscene. Edited by TerraFriedSheep, 14 February 2016 - 10:05 AM. I don't have anything against this topic, in particular. But can't people get the same information by just browsing the GMC Jam forum? The topic seems a bit repetitive, although I suppose it does offer some convenience. They certainly can (that's where I got all the information from after all), but as you say having all this information in one place is mostly for convenience sake. Trawling through all the posts from past Jams to find a certain game, list or devlog can take a while, so I was hoping this would get people to that information quicker. A good example I find from Jam to Jam is people asking what makes a good devlog. I would usually go back and find a winning devlog entry and post a link to that, but could now just navigate them to this post where they would be able to find every winning devlog. The same goes for other awards, people will be able to see quickly and easily what makes a good use of theme, or handicap etc. Well, I for once wanted to check what were the topics of past Jams at some point, but it turned out to be more complicated than I thought, considering that the first Jam has theme nowhere to be found in the first page, and games/voting thread doesn't have it explicitly mentioned with large letters, either. Opening massive number of links just to check some basic informations about all Jams is quite bothersome, and I gladly welcome the fact that someone else gathered that information in one place for quick reference. Kudos for Terra for that! Your game must have one or more achievements seperate from the main goal or objective. The game must have at least one cutscene. Also for Jam#8, with the missing category awards, I don't remember any of the others, but my game A Game That Fits The Handicap won best use of handicap. #6: Include one or more achievements to unlock within your game, separate from the main goal or objective. #7: The game must have at least one cutscene. I actually really like this topic and have pinned it in the GMC Jam forum for all to see. Nice work on creating it (must have taken AGES!) and I think it's great to have an overview topic like this for new members to see what's been going on over the last few years. 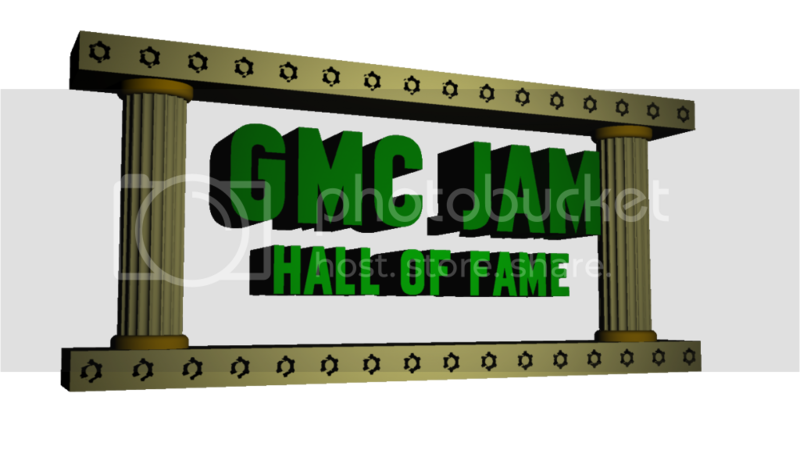 My one suggestion would be to add links to each Jam's game topic into the title for each of them for completeness..
And the first post could have a pompous banner with some greek columns and the letters "GMC JAM HALL OF GAME". Edited by the ch8t, 06 July 2014 - 06:32 AM. Great post, love it! have wanted something like this for aaaaages. Every time I see Dan's avatar, I immediately think 007. My God snail, that avatar! Thanks! The games topics are now also linked from the header to each Jam section. Haha, just as the doctor ordered! Added to the 'Hall of Fame' section! The numbers may be off by +/- 1 in the early Jams, because some data was removed / overwritten / deleted (or I just couldn't find it). But overall it should be pretty accurate. The one (unfortunate) trend it does reveal is the poor voter turnout, compared to the number of Jam entries. Yes, Jam #9 was a low point, in terms of voter turnout. But immediately following that Jam, we began discussing ways to encourage better turnout. And it had a positive effect. Very interesting graph, I hadn't realised back in Jams #1 and #3 that there were more voters than entries! I wonder if we'll ever see that happen again...? I've added a link to your post in the first post. Quick thing: I notice you have "Still Searching" under the Jam #4 full rankings. This is because that was the one jam where the full results were never posted. Following a small community outcry, it was returned for Jam #5. Thanks for that- I hadn't realised that was what had happened, you've saved me many searches there (and I've updated the post to "Never published"
Edited by TerraFriedSheep, 06 July 2014 - 06:25 PM. Why are there only voters-related statistics? I wanna see a games submitted vs. users that participated graph please. Not sure what you mean. In order to participate, users submit a game. So what is there to plot, besides a flat line at 100%? I mean the users that signed up to participate compared to the users that actually submitted a game. @chance: With nvrogers submitting two games last Jam, and 5 people or so working on a single Team Washboard game, I can clearly see how that plot wouldn't be such a flat line as you claim it would be. That said, it seems it would still oscillate somewhere around 100% and I'm not particularly interested in these specific statistics. If someone is really, really interested, they would better measure them themselves; this topic already provides a good starting point to start such search. ^^"
Ah, you mean "game topic posts with participation declared" against "game topic posts about actual game", then? Or in other words, percentage of games sent against games declared? Edited by Alice, 07 July 2014 - 12:23 PM. Nice. Good to see this topic finally up. (it's something that always annoyed me about the Jam actually, that the non finished entries just got deleted... wish they could be moved to a different topic of "tried but failed" entries or something lol, could be amusing. There were plenty of Jams where I had lotsa speil & screens & stuff but never submitted my pieces of shh.. shuper stuff in the end). Nice work winning Best use of Theme two Jams running, it seems you're the only one to have ever done so (although Jam 10 and 12 are still missing)! It would be hard to compile an accurate list, since (as others said) the posts are often removed. Awesome, thanks How did I miss that? I even used the post before it for the best of awards! It can inspire people to want to offer prizes (and give ideas of what to offer). It can encourage people to enter (in prospect of winning by rank or restriction or what-have-you). It shows appreciation to the generous folks who offered and gave prizes! It bestows yet more prestige upon the various winners, even if only in a small way. In fact, it grants an opportunity for more games to be listed because some prizes were given simply based upon being "so-and-so's favorite" or some other unique, non-Jam-official condition. Edited by GVmakesGames, 22 July 2014 - 11:33 PM. There is a positive correlation (around 90%) between the number of individual posters that post in the discussion topic and the number of entries that participated in that jam. Also notable is that there is a 0.78 rank correlation. Here is a lovely chart showing posters vs entries, because we love charts! And here is the actual data with the results in the bottom row. X Here indicates the number of posters for that Jam, ordered from lowest to highest. Y indicates the number of entries and D is the rank calculation required for the Spearman correlation. 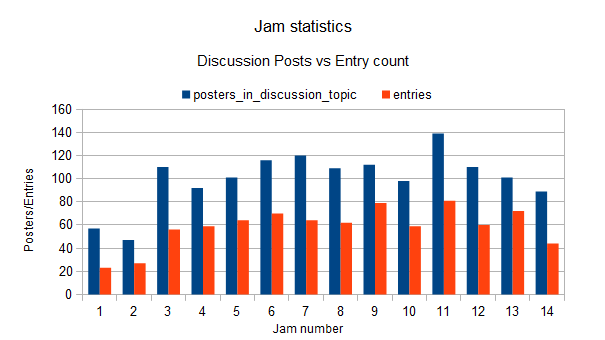 SO to sum up, if a large number of posters post in the Jam topic there most likely will also be a large number of participants that Jam. The two variables are closely interlinked albeit not perfectly symmetrical to each other. Edited by mr magnus, 23 July 2014 - 09:06 PM. Thank you. Also, I hate the post editor now, as he's messing up my fancy statistics I spent so much time creating. Edited by mr magnus, 23 July 2014 - 09:05 PM. Interesting post mr magnus, thanks for putting it together I've linked to it in the first post. As was mentioned in the discussion topic, as it stood we had ~50 unique posters with about a week to go before the Jam, which according to your research would suggest a relatively low amount of game entries this coming Jam. We are therefore in a position to see what difference the last week before the Jam / the three days of Jamming will do to numbers. It's obviously only this Jam we are aware of it, so won't be able to draw immediate conclusions but we might just see that the interest builds the closer to the Jam we get. I personally think "views to participants" is a more precise rate than "posters to participants", because not everyone would like to post in the middle of five guys randomly rambling if the theme could be CHIPS AND MOE or CHICK AND TIE. Then there are the newcomers that often avoid the discussion topic because... Well, they're newcomers. I felt very weird posting in the jam topic the first time I joined. Seems fast enough, I'll just replace the numbers from the old research with the view numbers. Well..... It's not as strong of a correlation, but there still is a 0.70 P. correlation and 0.69 S. rank correlation. So when it comes to actually predicting the number of participants it's a much safer bet simply to use the poster count, those two variables give a much stronger representation of each other, albeit the view count can also give somewhat of a prediction, it's just not as likely to be right. Edit: http://gmc.yoyogames...ost&pid=4606170 <<here, after I, dadio, alice and somebody else menaced praised him long enough, he asked the previous third place (diptoman) for a secret word. Edited by GVmakesGames, 28 July 2014 - 11:30 PM. Just a suggestion: You may wanna mention "Winner of Jam #" in front of the numbers in the Hall of Fame, maybe I'm just dumb but it took me a moment to realize what it was for. Also, you should use your second post to link to Jam games that have been continued. I'd love it if this existed. Thanks Ult! I'll look into adding a little note to the Hall of Fame section just to make that clear, as you probably aren't the only one who doesn't immediately recognise what those numbers mean. Hey hey. I was just trying to show off some of the older Jam games to someone a few days ago & noticed that some of the zip compilation links are dead! Any chance of those links being fixed or there being some kind of repository of all the zip compilations made? Was also thinking it would be good if we could gather all those zip compilations & get a torrent of 'em going to keep em alive? (Just concerned that the links there will all slowly crumble away & older Jam contents will be lost forever). You're right, just tried a few of the zips at random and they were dead. It's something that could be included in the first post of this topic (a link to a working zip download that is) as at the moment there is only a link to the full list of games as they were ranked, and not a download. I don't actually have the zip files for every Jam, and the ones I do have don't have all the games in. If someone has them / knows of working download links then I can add a link to it in the first post. Hmmm... I have most of em... I'll see what I can do about getting them all together & sorting something out (torrents etc) weekend after this one. I think the only tricky part would be making people aware this list exists, because it's not obvious you can find such a list at the bottom of a topic called "GMC Jam Stats". Maybe it could be a different topic altogether, but the stickied topic section is already getting crowded so it's hard to say. 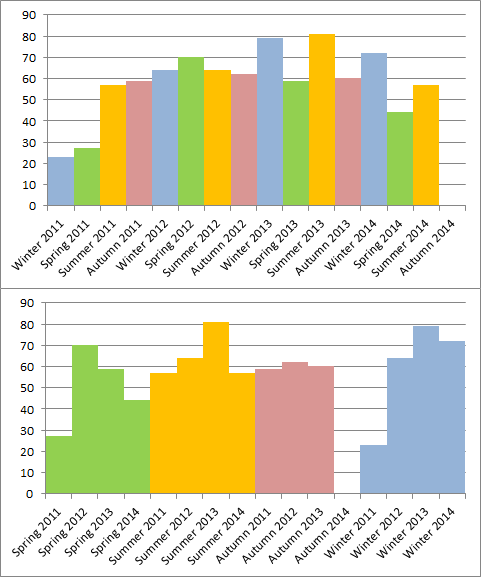 We haven't had a graph posted here for a while, so I thought as we are approaching our 16th Jam I'd take a look to see how the number of entries has varied between the years for each season. Also, as of the first 15 Jams, there have been 878 games entered into the Jams, with a rounded average of 50 per Spring Jam, 65 per Summer Jam, 60 per Autumn Jam and 60 per Winter Jam. Edited by NAL, 19 November 2014 - 04:42 PM. Thanks a lot! Not many missing awards now- I haven't been able to find these (or the remaining) missing images anywhere, so thanks for knocking out the entirety of Jam #10 in one fell swoop! Edited by TerraFriedSheep, 19 November 2014 - 05:56 PM. If you're interested in making more graphs like that, I'd be interested to see this one: A comparison of rank / alphabetical place in the zip (This might take a bit of research, since sometimes nocturne ranked them in the zip by username first, and sometimes by game name). Two separate graphics for before and after the randomizer was instituted.